Virtually sounding the poll bugle, Bharatiya Janata Party president Amit Shah on Saturday said his party will contest the upcoming Telangana assembly election on its own. 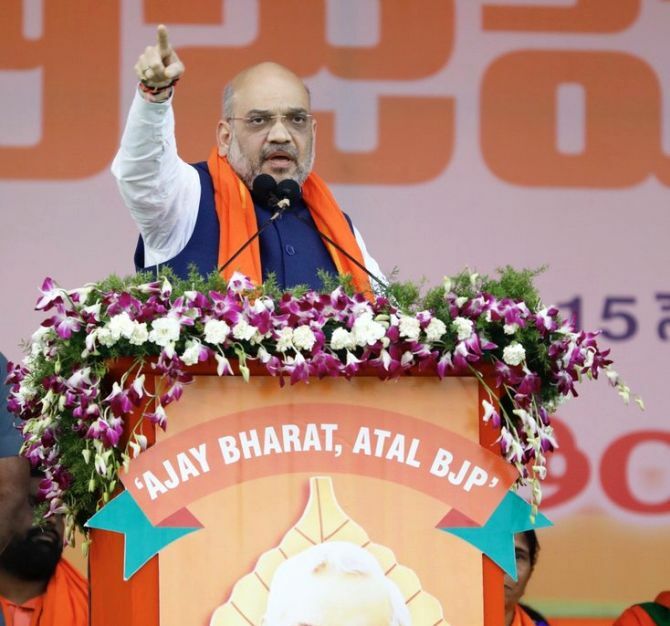 Formally launch the party's poll campaign at a public meeting in Mahabubnagar, about 110 km from Hyderabad, Shah said the BJP would not go for a tie-up with the Telangana Rashtra Samithi, the ruling party in the southern state. The BJP would not have any alliance with any party and it hoped to emerge as a "deciding factor" in the upcoming polls, he said. "We are not going to have any political tie-up with the TRS. The BJP will fight on its own strength. We will fight against appeasement politics also," Shah told reporters in Hyderabad, before leaving for Mahabubnagar. The saffron party would also fight against the "stalled progress" of the state, he said, when asked about allegations of a tacit understanding between the BJP and the TRS. On the proposed Grand Alliance of the Congress and other parties in the state, Shah said the Telugu people had not forgotten how the Congress had treated their leaders like former (undivided) Andhra Pradesh chief minister Anjaiah and former prime minister P V Narasimha Rao. Hitting out at the TRS, he claimed that the K Chandrasekhar Rao-led party was earlier in favour of simultaneous elections to the state Assembly and Lok Sabha, but subsequently changed its stand. "Prime Minister Narendra Modi had proposed 'one nation, one election'. (Caretaker CM) Chandrasekhar Rao had also supported it initially.... I want to ask a straight question to the ruling party (TRS) and the chief minister. Why are you burdening the people with so much of expenditure (due to polls)? What is the reason for advancing the election by nine months?," Shah asked. He wanted to know why the state assembly was prematurely dissolved, just a few days after the chief minister had expressed his willingness for simultaneous polls. Quoting from reports, the BJP chief said 4,200 farmers committed suicide in the state in the last four years and claimed that some of the schemes of the central government were not implemented in Telangana properly. He said many poll promises such as the "double-bedroom housing scheme" were not fulfilled. Shah said the Centre had allotted funds to the extent of Rs 2.30 lakh crore to Telangana under the 14th Finance Commission as against "a mere Rs 15,000 crore during the 13th Finance Commission". He claimed that the state government was not celebrating September 17 (the day the erstwhile Nizam state had merged with the Indian Union in 1948) officially due to "pressure from the AIMIM (All India Majlis-e-Ittehadul Muslimeen) and as part of vote-bank politics". "Are we going to handover Telangana to the new-age Razakars (private militia that had resisted the integration of the Hyderabad state into the Dominion of India)? The Telangana people should decide," the BJP chief said. He added that despite being aware that there would be no quota based on religion, the TRS government had passed a bill in this regard and sent it to the Centre for consent. Shah said the new districts that were carved out by the TRS government lacked infrastructure. He slammed the Congress, alleging that it did not allow the OBC Commission Bill to be passed. Meanwhile, AIMIM chief Asaduddin Owaisi said the BJP was suffering from "selective amnesia". "You (BJP) will not succeed either in Hyderabad or in Telangana. I would like to say that if you have any strategy, Mr Shah, then come to Hyderabad and contest the parliamentary polls from here...," he said, replying to a query. Owaisi claimed that the BJP would not be able to save their five Assembly seats in Hyderabad as also the Secunderabad Lok Sabha seat. He took a dig at the saffron party, saying it was suffering from "selective amnesia", and claimed that it had forgotten that Modi had also advanced the polls when he was the Gujarat chief minister. Lauding Rao for advancing the polls by nine months, Owaisi said, "It is a bold decision. You (BJP) are scared. You fight it out if you are concerned." He said there was no incident of communal violence in Telangana in the last four-and-a-half years. "There is an atmosphere of peace and growth...we have been saying that the next chief minister will be K Chandrasekhar Rao. Is there any (CM) face in the BJP?," the AIMIM chief asked. The party-wise strength in the 120-member Telangana Legislative Assembly before its dissolution was -- TRS 82, Congress 17, AIMIM 7, BJP 5, TDP 3, Vacant 2, the CPI, CPI(M), Independent and nominated member (one each). Rao had released a list of 105 candidates for the state's 119 seats immediately after the dissolution of the Assembly. Do the Gandhis have the maturity to forge alliances?